This airline was formed in June 1945 as the National Skyway Freight Corporation by a group of former C-46 'Hump' flyers with General Claire Chennault's 'Flying Tigers' in China during WW2. 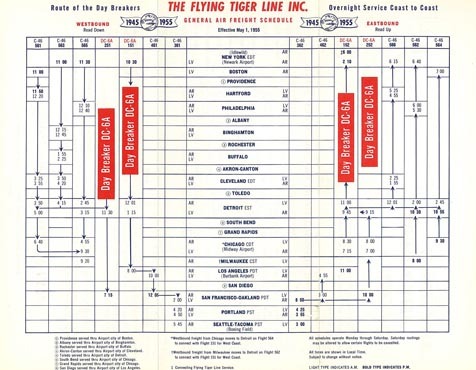 Renamed The Flying Tiger Line in 1946, the airline concentrated wholly on freight operations, military charters as well as a scheduled U.S. transcontinental service opened in the late 1940s In 1969, the scheduled routes were augmented by the addition of a service across the Pacific. A network of scheduled routes to Europe and the Middle East were added when another all-freight operator, Seaboard World Airlines, was taken over in October 1980. 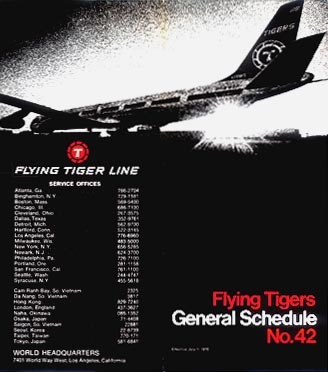 The Flying Tiger Line was itself taken over and merged into Federal Express in August 1989.
visit the Flying Tigers page of Perry Sloan's "AirTimes" site. This page last updated February 6, 2016.